It’s no secret. We’ve been fans of SketchUp from before day one. In fact, for many of us, SketchUp’s pioneering user interface and ease-of-use inspired us to do for mechanical design what SketchUp did for architecture and entertainment: create the fastest and most intuitive user experience possible. Our shared vision has also fostered a strong partnership between our companies. SpaceClaim uses SketchUp’s own technology to read and write SketchUp files. And recently, SpaceClaim has taken that technology to the next level to breathe new life into mechanically-oriented SketchUp files. Download the Free Adobe Flash Player. If you love SketchUp as much as we do, but you need to work with parts that come from mechanical CAD systems or are destined for detailed mechanical design, you might see value adding SpaceClaim to your design process. We’d love the opportunity to show you how it works on your designs. If you’d like to learn more, request a demo and we’d be happy to show you how well SpaceClaim works on your own geometry and models. "SpaceClaim was the right solution for this project as it included a lot of conceptual work, so I would not have been able to use a history-based system. The flexibility of direct modeling was a significant advantage as I designed the Volkswagen Electric Bike with SpaceClaim. All the engineering was done in SpaceClaim. Most of the surface work was done elsewhere, and then everything was joined and modified in SpaceClaim and passed on to CAM and to production." Watch a Discovery Channel clip showcasing the development of this electric bike in SpaceClaim. "SpaceClaim and Google SketchUp share a long-term vision of enabling everybody to work in 3D. SpaceClaim's ability to turn SketchUp files into precise solids suitable for manufacturing - without remodeling - will enable mechanical SketchUp users to more quickly realize their vision, and help SpaceClaim users take advantage of the millions of models available in our 3D Warehouse." "I have one shot to get the design right. My goal was to find a 3D design solution that would enable me to be efficient, fast, productive, and proficient in a short time." "We've been using SpaceClaim for about 17 months and have more than recouped our investment in time saved, error reduction, and faster time-to-market. 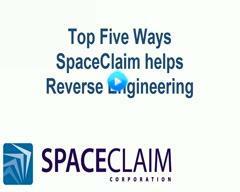 SpaceClaim is extremely easy to learn. Even our intern, without training, can be productive in just two weeks. You can't beat that." "SpaceClaim lets me bring designs to fruition four to five times faster than previous methods." "From the conceptual side, SpaceClaim is a must-have tool. My clients' jaws drop when I make edits in real time, online, or in person."